If you study women’s history, something that comes up a lot is that for centuries, women weren’t allowed to learn, either weren’t allowed to go to school at all, or once they could go to school, there were limits and certain subjects weren’t allowed to be taught. Do you know people used to think that it would harm a woman’s ability to have a baby if they learned too much? Or even read too much? It’s hard to believe, isn’t it? Apparently, this globe was made in a girls’ school that was teaching geography, but they couldn’t afford to purchase already made globes. So the girls sewed their own! This one was sewn by Lydia Satterthwaite, who was born in 1803, probably in Pennsylvania. It’s made out of silk, with silk embroidery and paint. Isn’t it lovely? 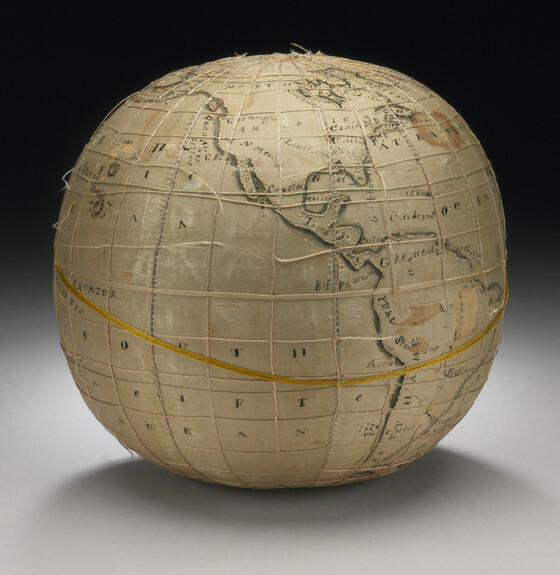 This globe is owned by the Los Angeles County Museum of Art.